AN IMPRESSIVE FAMILY RESIDENCE! HOME ESTATE AGENTS are proud to offer for sale this five bedroom extended detached family residence situated in the popular area of Davyhulme. If you are looking for space & a high quality finish be sure to book your viewing. In brief the property comprises entrance porch, hallway, large lounge, dining room, study, dining kitchen, downstairs WC, shaped landing, the five well proportioned bedrooms, family bathroom & a useful converted loft space. Two of the double bedrooms both boast walk in wardrobes & ensuites three piece bathrooms. 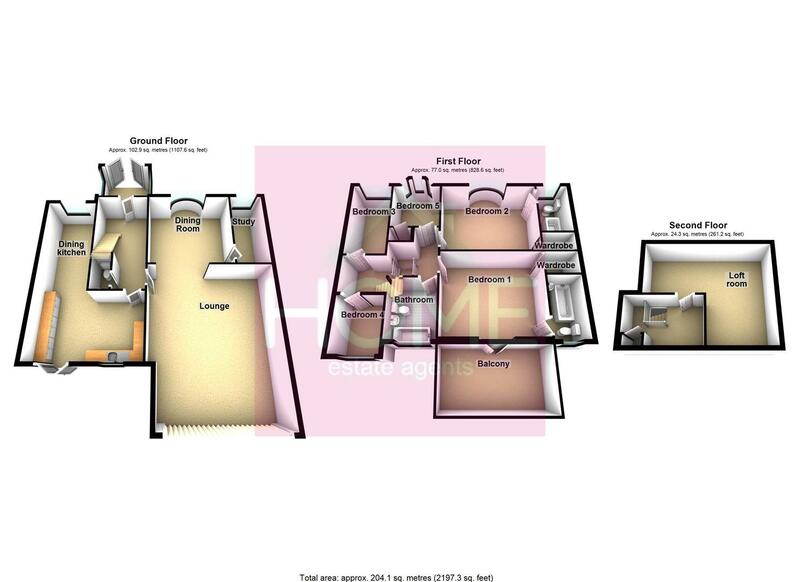 The double bedroom to the rear even benefits from a south facing balcony! The property is warmed by gas central heating & is fully uPVC double glazed. Externally to the front there is a generous driveway providing ample off road parking whilst to the southerly facing rear there is a wooden decked patio area & pathway with mainly lawned garden beyond. Ideally placed for the well regarded schools, transport links & amenities. To book your viewing call HOME on 01617471177. UPVC double glazed on three sides and UPVC double glazed door to the front. Entrance to the hallway. UPVC double glazed bay window to the front, picture rail and archway to the lounge. Individually designed doors to the rear leading to the south facing rear garden. UPVC double glazed window to the side and television point. A two piece suite comprises low level WC and wash hand basin. Towel rail and tiling compliment. A comprehensive range of matching fitted wall and base units with rolled edge worktop over. One and a half unit stainless steel sink with mixer tap. Space for appliances including dishwasher,washer dryer and oven. UPVC double glazed French doors leading to the rear garden, wooden affect flooring and breakfast bar. Closed balustrade and stairs leading to converted loft. UPVC double glazed doors leading to the balcony. Walk in wardrobe and entrance to ensuite. A three piece suite comprising of a low-level WC vanity wash hand basin and bath with shower over. Tiling to complement and UPVC double glazed window to rear. UPVC double bay window to the front, walk in wardrobe and entrance to ensuite. A three piece suite comprising of a low-level WC vanity wash hand basin and bath with shower over. Tiling to complement and UPVC double glazed window to front. A modern four piece suite comprising of a low-level WC, wash hand basin, bath and separate shower cubicle, tiling to complement and UPVC double glaze window to rear. A large room which offers a variety of uses. Storage into the eves. Externally to the front there is a generous driveway providing ample off road parking whilst to the southerly facing rear there is a wooden decked patio area & pathway with mainly lawned garden beyond. We have been advised that the property is Leasehold with a annual ground rent of £5.00 payable.